Some classics never die and An American in Paris is one of those Golden Age Hollywood classics that was perfectly directed by Vincente Minnelli in 1951 which is still one of the greatest musical productions of this era. It was critically acclaimed by the Academy and managed to win six Academy Awards and even today, has dated quite well. The movie itself is based on Gershwin's 1928 symphonic composition, "An American in Paris" and revolves around a former US solider called Jerry Mulligan (Gene Killy) who decides to retire in France and become an artist. As fate intervenes, Jerry meets and falls in love with an assistant in a perfume store called Lise (Leslie Caron) who is engaged to an older man, all the while trying to avoid a wealthy American patriot called Milo (Nina Foch). It's a complex love triangle that director Minnelli uses drama, romance and comedy to progress. But where the movie does shine is through the spectacular music and dance that showcases the talents of all those involved, especially the quick feet of Kelly. Some of the dance scenes are truly fabulous and even though some "modern" movies have attempted to recreate the glamour of Hollywood's Golden Age, many have failed. If you are a fan of movies from yesteryear or love musicals than An American in Paris is a timeless tale that can be enjoyed by everyone. The transfer to Blu-ray is quite remarkable and contains vibrant colours, sharp images thanks to the restoration techniques of Warner Bros. It's amazing that a film of this age can look so good after these so many years from deep blacks and extremely clear pictures. Although the sound has been remixed and restored to an extent, it only supports Dolby Digital which is still impressive and does sound crystal clear throughout the movie. 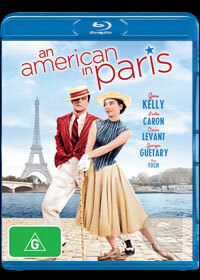 When it comes to extras, enthusiasts will enjoy the audio commentary, rare interviews with the director and the casts, behind the scene documentaries and various other tidbits to give you a true insight into the making and phenomena of An American in Paris.